“Among the many excellent and indeed divine institutions which Athens has brought forth and contributed to human life, none, in my opinion, is better than the Mysteries. For by their means we have been brought out of our barbarous and savage mode of life and educated and refined to a state of civilization; and as the rite is called “initiation,” so in very truth we have learned from them the beginnings of life and we have been given a reason not only to live in joy, but also to die with better hope”, (Cicero, De legibus,ii, 36). According to ancient Greek mythology, Pluto, the god of the Underworld, abducted the beautiful Persephone, daughter of Demeter, the goddess of agriculture and made her his wife. Demeter furious left Mount Olympus, she got herself up in a guise of an old and much diminished woman and came to Eleusis, where she found great hospitality and affection. At the same time, Demeter vowed that she won’t set foot on Mount Olympus and that she wouldn’t let anything grow on earth until she could set eyes on her daughter again. A terrible famine assaulted the earth, so Zeus was forced to intervene. After negotiations, they reached the following solution: Persephone spent part of her time in the Underworld with her husband and the rest on earth with her mother. It was, according to anthropologists, a beautiful story invented by ancient Greeks to explain the cycle of the seasons of the year. 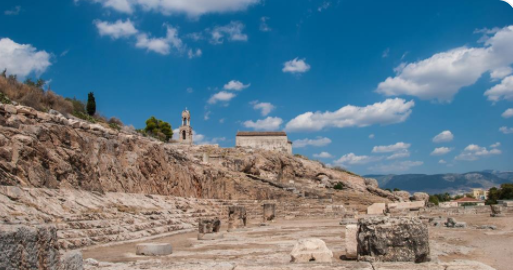 As for Eleusis, Demeter rewarded her by teaching to the successors of the royal throne the “Mysteries“, which gave the city glamour and wealth, making it one of the five great destinations of Antiquity (Athens, Delphi, Delos, Elefsina, andOlympia).